Thanks for your informative post. I agree. Nice call to action...hope it brings you lots of biz. Thank you Krista and Li! 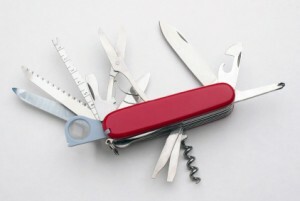 Michelle- I love Swiss Army Knives and you're right.. a Home Stager comes with many tools all packed into one neat package. Michelle - what a great parallel to draw! I have DEFINITELY learned to be more prepared and with the proper tools since becoming a stager....never know what skill, item, or tool you might need! Kathy: I have a SAK in my car, my purse and my briefcase. I think every real estate agent and home seller should have a home stager to help solve their home selling problems. Sharon: I thought of it when I pulled out my SAK the other day to fix a hinge in a client's house. I like to be the problem solver. Michelle - Ok, I had to see where you were going with the "home stagers are like Swiss army knives"... you did not disappoint! Of course, my favourite arm of the SAK is the wine bottle opener, but nuff said! Glad you liked the post, Sally! Great psot...so many things in your tool kit!!! Okay.... you just officially assigned yourself a new nickname. SAK it is, from here on out! In all seriousness, your experience as a home stager in Los Angeles, surely sets you apart. Great post and great analogy. LOVE your analogy, too, Michelle! We certainly do carry a lot of "tools" in our bags, hearts and minds. One thing I've noticed lately is how many women carry a SAK with them - as a tool, not for protection. Interesting. Julia: I've been carrying a SAK for years! Great Analogy Michelle. We carry not only a lot of tools but a wealth of knowledge that we have received through education, training, and fellow stagers and AR! Hi Michelle--great post; great analogy. Like the Swiss Army knife we never know what tool we will be called upon to use but we are expected to have them all with us. Love this post. Janet: The better prepared we are, the more valuable we are to our customers. Love the analogy you are right as Stagers we do focus on ALL the details. Yes I too have a SAK in my tool bag. Love it-I do not go anywhere without mine!! Increasing the tools in my belt is something I'm working on constantly. Great analogy, Michelle! Thanks, Cathy Lee and Beth. Michelle - just reading your post made me want to hire you to stage my house and I am not even selling. :) Great info! What a nice thing to say, Wanda. Thank you!